I thought it was important to have an understanding of what we might be facing before we dig in (pun intended). The following are the categories I thought were important to know about. My mom wants to plant flowers so bees will come pollinate our garden. I hate bees :/ I hate all insects. I think we will deal with other insects/animals on a case by case basis. Not sure what we are up against yet. So apparently there are variations in the soil itself, not just whether a climate is warm or cool. Not sure how this is going to affect our yield. Many of the websites mention that certain items grow better with soil at certain Ph levels, with certain amounts of nitrates, etc. There are tester kits we could use to test the soil but we just asked around at what people around here grow. 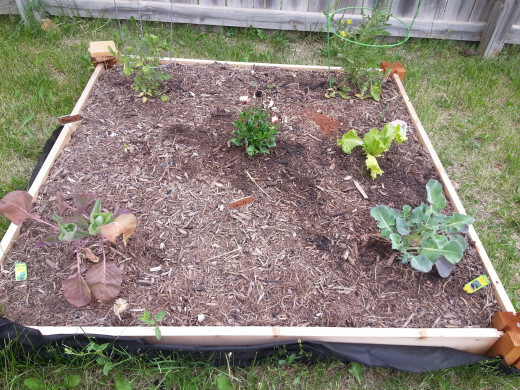 As far as in ground or above ground (raised bed), it seems to be just a matter of personal taste. If we want to go in ground we are going to have to till the soil which would involve renting a tiller from <<insert home improvement store here>> for $43 for four hours plus a truck to haul it here and back. Argh. If we want to do raised beds we are going to need the wood to build it and the manure/soil to fill it. Either way we are looking at about $100 would be my guess. two different types: determinate and indeterminate. Indeterminate is the more common type grown using a stake or wiring and which needs to be harvested/pruned as the fruit grows. Suggested that we start from plant not seed. Suggested that we start from plant not seed. 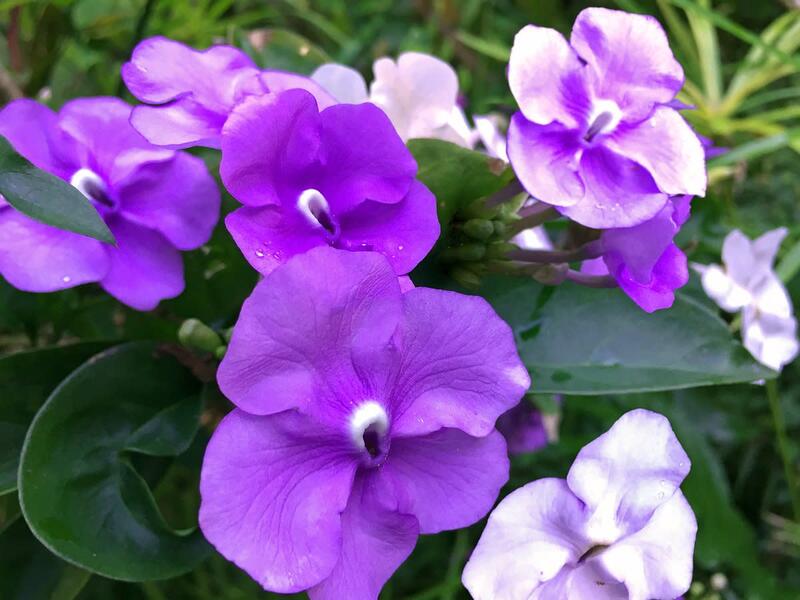 Start in the spring or late summer. Don't use store bought potatoes as seed, buy certified disease-free. Lots of water. Can be planted 4 weeks before last frost, once ground is soft enough to dig. Planted not from seedling, with treated seeds. Not much water required. Can be planted 3 weeks before last frost. Don't cover seeds with much soil. After about 2 weeks. They came up fast but then started slowing down. Just planted garlic bulbs from a friend's garden right into soil. After just a week. They are growing faster than I expected! Despite some advice against it, we are so eager to get started that we decided to start with seeds. Since the last frost hasn't come yet we can't put things into the ground. We figure it is a low risk option to start with seeds - we can always purchase the plantlings later if we the seeds don't grow. We purchased two starter kits at about $5 each (we bought one and then ended up getting another one). I found this cool website via pinterest: http://www.sproutrobot.com. You can put in your zip code and it tells you when you should be planting various items. 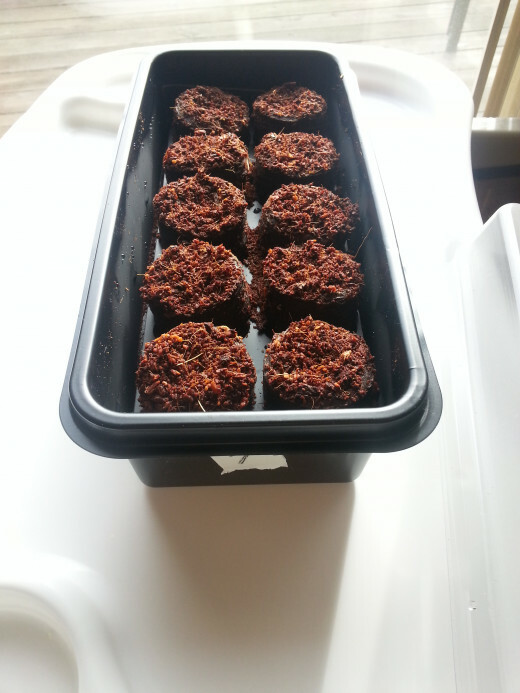 We had already started the seeds for carrots, marigolds, onions, peppers, and tomatoes but the website suggested broccoli could be started right now so we decided to go ahead and do that in a second starter kit along with leaf lettuce, basil. 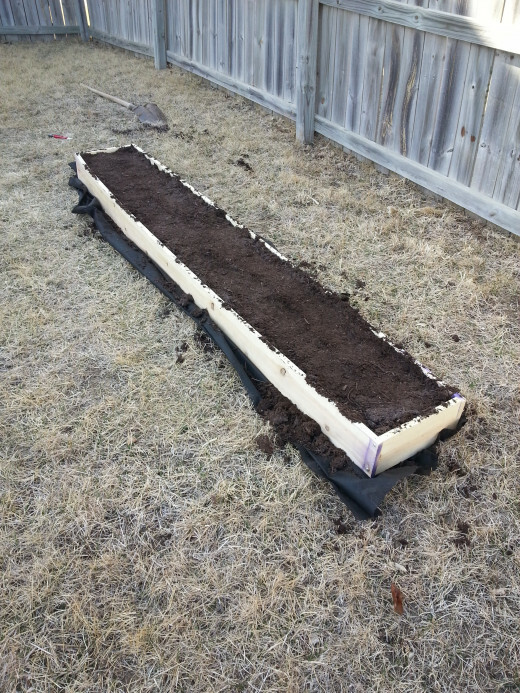 After my research though I noticed that leaf lettuce and onion need to be started before the last frost so we have pushed up our date on getting the ground ready. Gotta go get some wood! 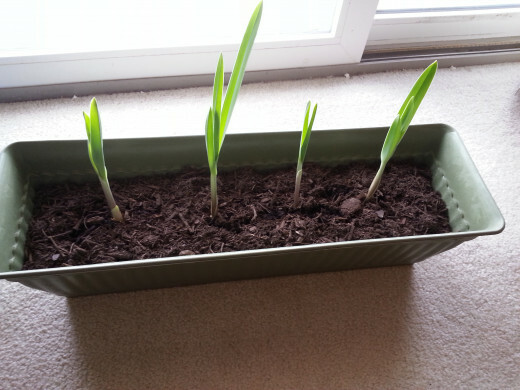 We started some garlic a few weeks ago by just burying some bulbs in some dirt and keeping it very lightly watered. It shot up really quickly at first but now seems to be slowing down a bit. My mom also bought a sunflower kit and we are starting that. Love sunflower seeds. We must have got the planting bug because my mom also bought a blueberry plant. I did some research and it looks like blueberry plants need a very specific soil content so I'm not sure how well it will grow but the box it came in says it should be easy. It says not to plant until the danger of frost is pretty much over so it is chilling in the garage for now. Deciding on a spot in the backyard. First three in the ground. From left to right: Onions (2), Lettuce (3), Broccoli (1). 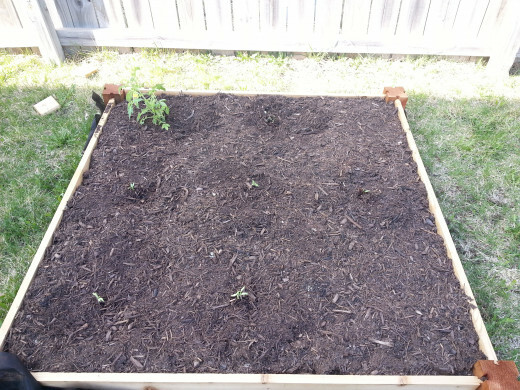 Peppers and Carrots are occupying those spots where nothing seems to be growing. Tomatoes are in the back. Flowers for pollination in the middle. Front left is brussel sprouts, front right is cauliflower, and middle right can't remember now. The broccoli makes its first appearance! 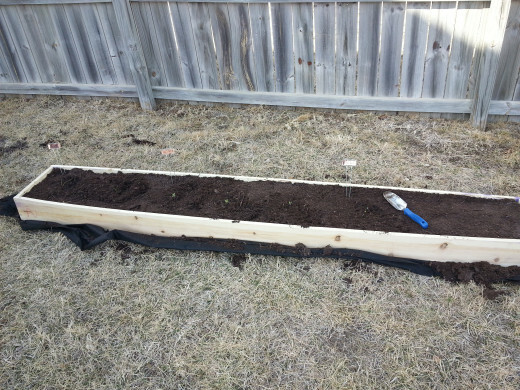 I wanted to put our garden into the ground but others were more inclined to do raised beds so we decided to do that. We went to <<insert large home improvement store here>> and found some cheap wood on sale so we bought enough to make two 8x1 rows boxes (see photos). We then filled them with tons of bags of fertilizer - a variety, including things like Miracle Gro, that we bought at a few different places. I would suggest buying it early as they are much cheaper that way. 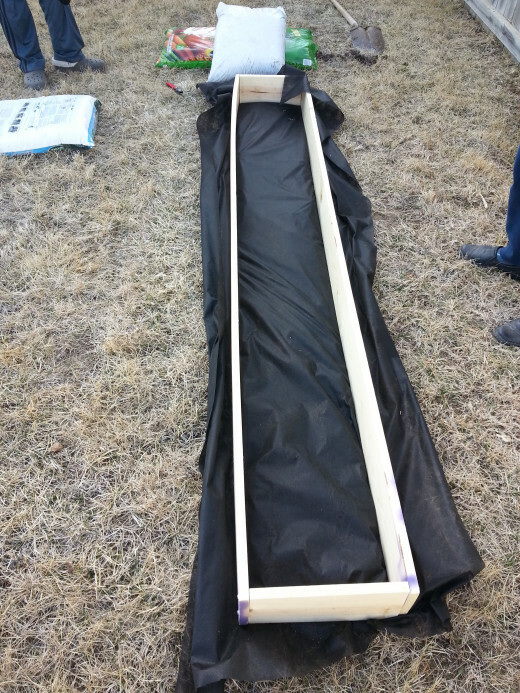 We used 3.5 bags (approximately 150 lbs) of fertilizer to fill one box. Make sure to pack it in - we stepped on it - as you put it in the planter. We then decided on a place in the backyard. This was a debate because our backyard is not flat, so we had to weigh the ground versus the sun exposure. Then the placed a weed blocking layer under the wood, as you can see from the first picture above. March 25th is the official date of our first in ground planting. 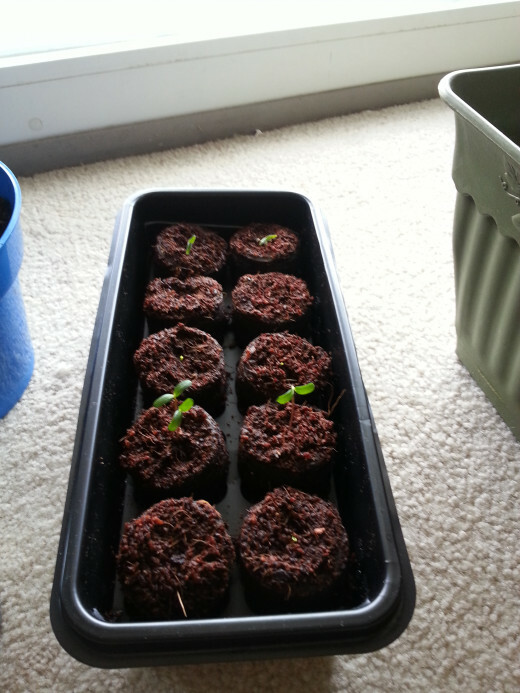 In this one we planted the ones that like the cold: broccoli (1 plant), onions (2 plants) , and leaf lettuce (3 plants). We were actually transplanting these, as we had planted them with our little seeder thing a couple weeks ago and they were already sprouting. Good old Nebraska decided to deliver us a windstorm the day after the transplant so we'll have to keep an eye on them. 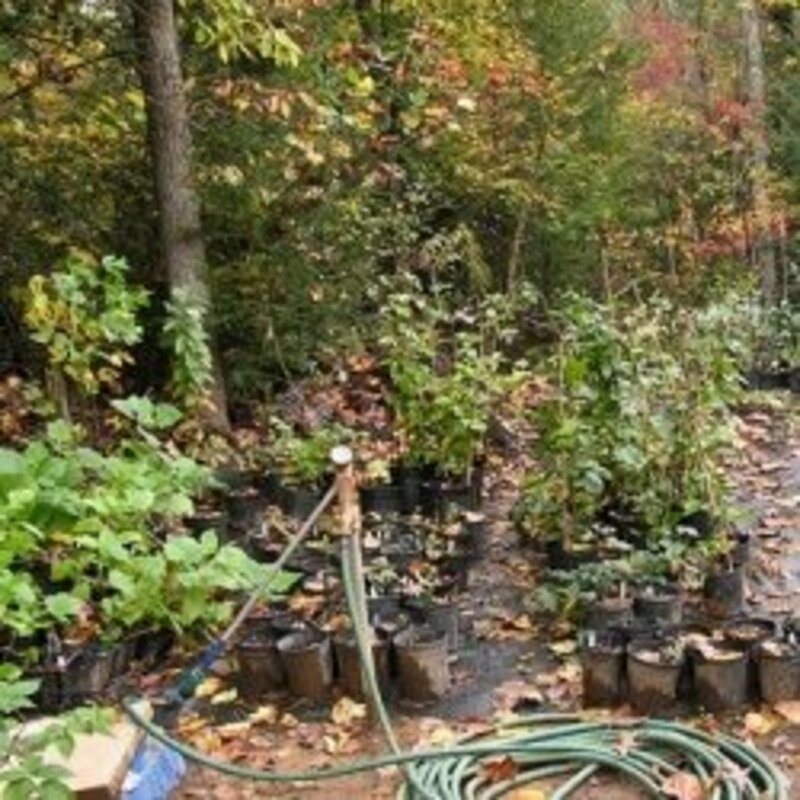 The rest of the plants went in in phases, some going in the very next week. If stuff didn't appear to be growing after a couple weeks or so we just bought some more plants at the store and planted them in their place. 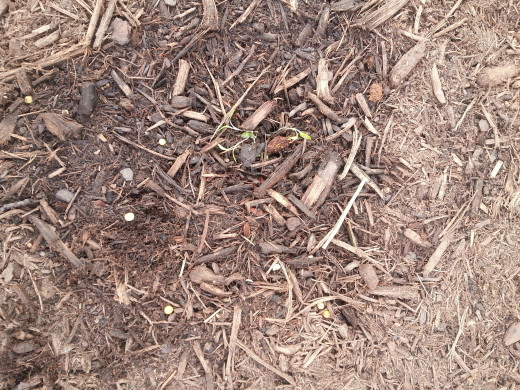 So far, most of the seedlings have not panned out, with the exception of one of the broccoli. Fence-wise we've decided to go with a liquid fence spray for rabbits and deer. Hopefully, this will save us the money of getting a fence (the spray was $13) and save us the time of building it. Neither way is a 100% guarantee of no rabbits so we'll just have to see. This crap smells terrible but it washed easily off my hands. I read a website that recommended you make sure that the spray has the ingredient of egg in it, which ours did. Update: The liquid fence works as long as you keep up with it pretty well, so we are thinking of changing our game plan and doing an in ground garden. A friend of mine just happens to have a tiller so we are considering tilling a large chunk of ground and then surrounding it with a plastic wire fence. Will keep you updated on what we end up doing. We would like to get it done before trying to plan a winter crop in September ish. small white egg type things in the garden. Help! I found these little round white egg things (see photos below) in the garden after only having been planted for three days. What are these? Update: I did some research and found out that these little white balls/eggs are likely one of two things: nutrients in the fertilizer that are designed to be released slowly so they are encapsulated somehow and will dissolve as time goes by OR eggs of unknown creature origin. I'm going to hope that it is the first case. I'm not sure how I can tell other than just by waiting to see if a bunch of bugs pop out of the plants, which seems likely whether these are eggs or not. The death of the bushes. 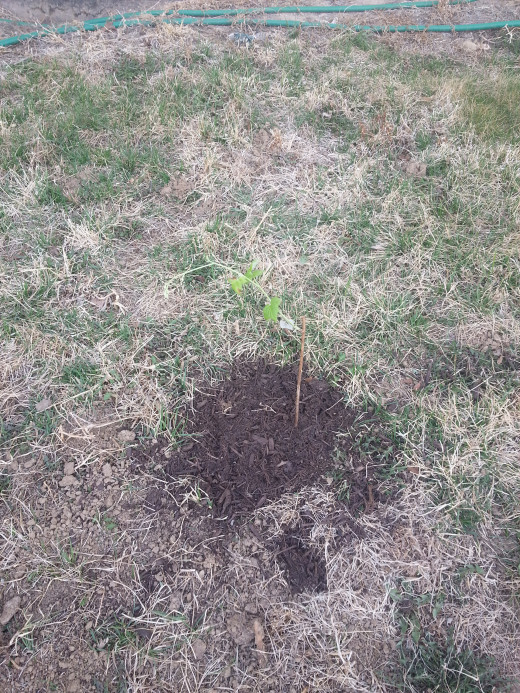 So... below you will be a picture of a beautiful blueberry plant planted in the ground. Unfortunately, along with all our new veggies and fruits planted in the background, lots of weeds grow there too and we don't take as good a care of the yard in the back as in the front. One sad day, my wonderful husband decided to mow the back yard and since he isn't busy planting he didn't even think about the fact that there were two hidden plants back there, so needless to say, the bushes got mowed. Hypothetically I don't see why that should keep them from growing at all, but I'm not holding my breath. Note to self: mark where all the plants are. So above (pretty far above) you'll see that we had planted some garlic and that it was shooting right out of the ground. The person who gave me the garlic told me to plant the entire head into the ground. However, after doing some research, I began to suspect that you are only supposed to plant a clove of it. When it had grown nearly a foot and had not flowered, we decided to just dig it up and start again. The heads in the ground were all mush. 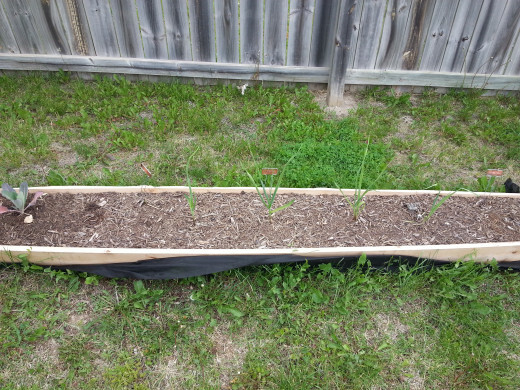 Since then, we replanted the garlic and you can see it growing in one of my progress pictures. 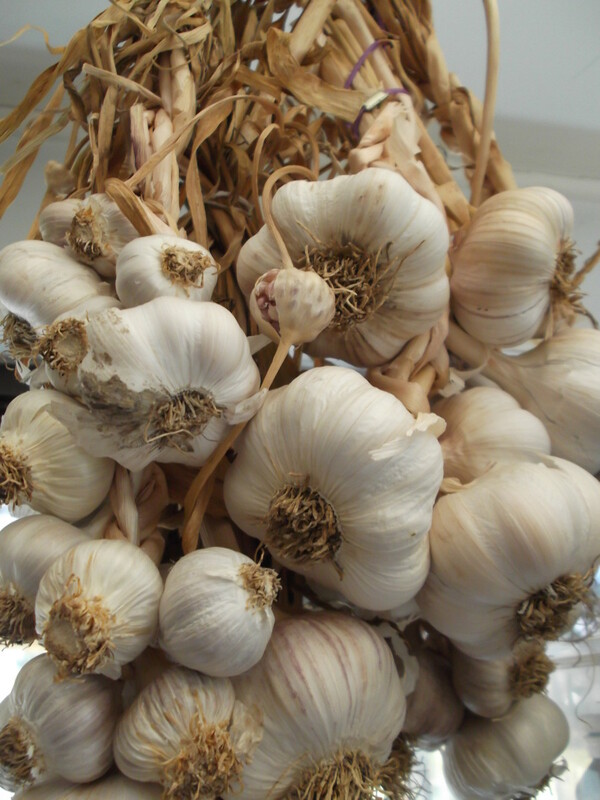 I am convinced that garlic is a weed because it grows that fast. My husband's grandfather told us to harvest after the plant had flowered and the flower had died, so I'll let you know how that goes. Now that we've done all the work, watched some of our crop lost to rain, wind, or animal, it is getting time to harvest. Knowing exactly when to pull up plants seems like it would be tough until we really get the hang of it. 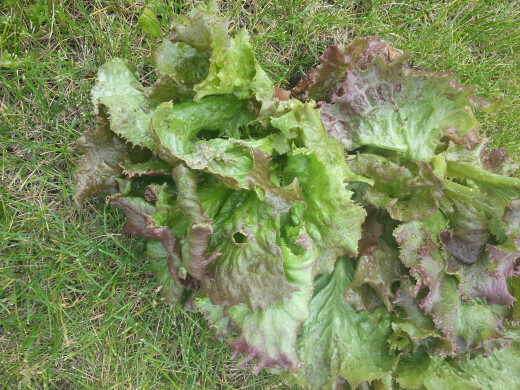 The first plant we tried to pull up was the lettuce (video below) and it turned out that we had waited too long and that it had bolted (term for waiting too long to harvest and the plant gets bitter and doesn't taste good). Today we are going to attempt to harvest the one broccoli that has survived the animals (if you use the spray, you really gotta keep up with it, especially when you get as much rain as we do). 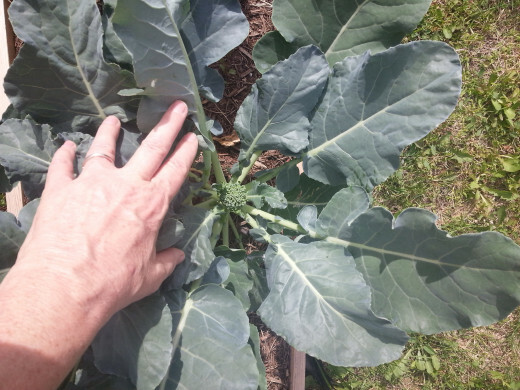 I did some web researching and found that broccoli is ready to harvest when the head is about 6-7 inches across and the broccoli florets start pulling away ever so slightly from each other. Thanks for the comment. As far as soil versus fertilizer, I would guess that fertilizer has extra nutrients that help ensure the growth of the plants that the soil doesn't. But again, I'm a rookie so I would have to do some more research on that. 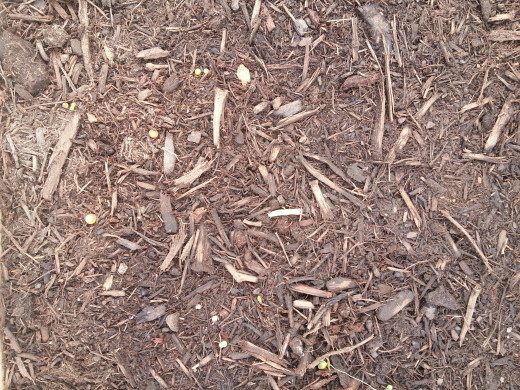 Oh, and as far as those eggs - we are hoping they are just time realize pellets from the fertilizer and not bugs. I'll be updating my hub soon to include the information I found in my research. Happy planting! 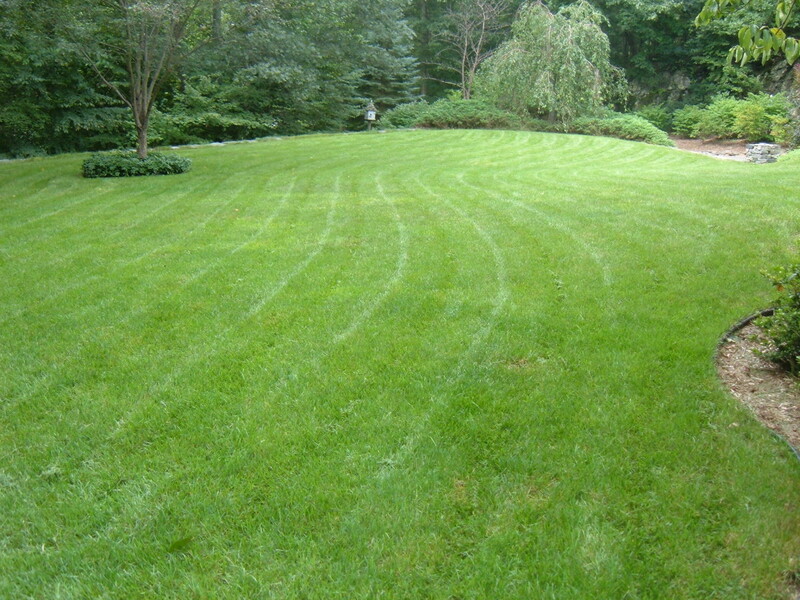 Nice, user friendly guide on how to make a backyard garden. Pls don't laugh at my question, as I have killed many plants out of my sheer ignorance. But I want to ask -- how is fertilizer different from soil, and can fertilizer replace soil? Also, I like your mysterious ending about the eggs. Voted up. Good luck in your gardening efforts.